As a graduate of Hopeworks, you know how enthusiastic we are about rooting for your lifelong success. We are incredibly proud of the things our alumni are accomplishing. Even when you have moved on from our programs, we want you to stay connected to our remarkable community. Whether you want reconnect with old friends or are seeking some professional advice, you’ll always be part of the Hopeworks family. We encourage all of our alumni to give back to Hopeworks by volunteering with a new generation of Hopeworks students. New students will benefit from hearing about your experience. Even if you’ve moved away or can’t find the time, the Alumni Giving Circle is a great way to support our projects. Stay connected through our alumni group Facebook page. Alumni gathered at Hopeworks in October for a great “Mental Health in the Workplace” session with Triana Martinez and Tonya Lapido. Several alumni attended our 2018 Annual Dinner where we honored our Chief of Police, Scott Thomson. Alumni Ashlee Alexander, Nyree Oliver, Laundra McCulluogh, and Alex Collazo all received scholarships! Alumni and GIS Technician, Chris Newbill and Drone Intern Shane Blaney passed their Remote Drone Pilot Exam and are now certified Drone Pilots! It makes our day when our alumni share their achievements with us. Consider us permanent members of your cheering section. 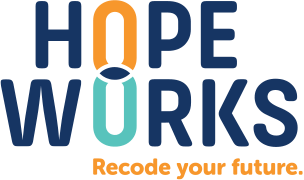 Share your latest news with the Hopeworks community so we can applaud your ongoing success.